A buffer zone may be required to protect the birds, significantly encroaching on the festival site. A pair of ospreys which hold a key role in deciding whether this year's T in the Park goes ahead at Strathallan Estate have defied festival organisers by returning to their old nest. The birds of prey were allegedly seen on their long-term roost near the Perthshire estate on Monday, despite attempts by organisers DF Concerts to usher them to a new custom-built nest. It is understood that the ospreys' return to their former home means a buffer zone of 2500ft will likely be required to safeguard them during the three-day festival, encroaching significantly on the proposed festival site. A spokesman for RSPB Scotland said the wildlife organisation was "fully satisfied" the birds had returned to the old nest. An action group made up of local residents opposed to the new festival site, Strathallan T Action Group (STAG), claimed the arrival of the ospreys now "rules out" the festival being held there. However, festival organisers have disputed video footage which allegedly shows the birds in the nest and have asked for the film to be authenticated. A spokeswoman for DF Concerts said although the ospreys had been seen in the vicinity of the nest, the company believes they have not landed there. Police were called to the site of the nest near Gleneagles for a second time on Monday over fears an active nest was being disturbed. 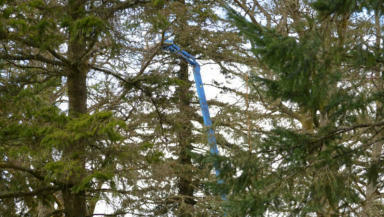 The RSPB called police because a cherry picker vehicle being used by DF Concerts to try and divert the birds to the new nest was still present after the organisation claims the birds roosted on the old nest. 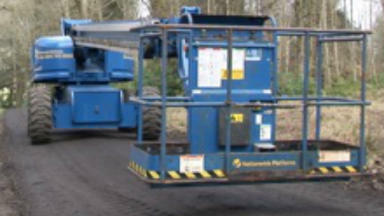 The company was also accused of driving a tractor up and down the road honking its horn. The cherry picker was removed late on Monday night. Ospreys are provided the highest possible protection under the Wildlife and Countryside Act and it is a criminal offence to disturb them during the nesting and breeding season. 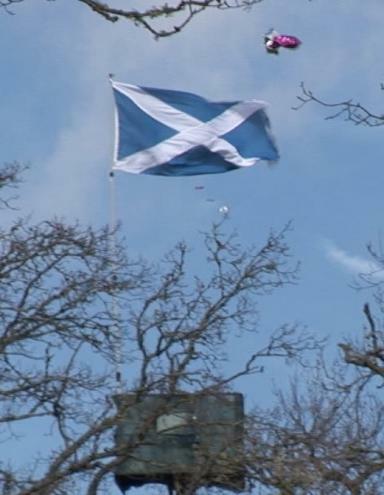 Tactics used to encourage the ospreys to roost away from Strathallan included balloons, flags and a fully extended cherry picker near the nest - moves which RSPB Scotland previously condemned as "unethical and unacceptable", although not illegal. 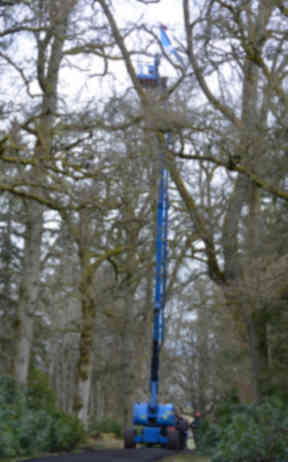 James Reynolds of RSPB Scotland said: "We are aware that the ospreys have been reported at the nest site and indeed we have some video footage that shows one of them alighting on the nest with a stick. "This blatantly means this is now an active nest and is protected from disturbance so the cherry picker should have been removed immediately. "I was informed that that did not take place and contacted Police Scotland to make them aware of that. "As this nest is closer to the main festival activity, the risk that the birds will be disturbed by the festival has increased and that will be reflected in our response to the planning application." The owners of Strathallan Castle Estate spoke out last week to urge opponents to support plans to host the festival there. Jamie and Debs Roberts said they feared Auchterarder could be dubbed "the town that said no to T in the Park". DF Concerts currently do not have planning permission to stage the huge event, which attracts 85,000 revellers each day, in July. A 28-day consultation period is underway and a decision on the planning application by Perth and Kinross Council is expected in May. A T in the Park spokeswoman denied any wrongdoing. She said: "We’ve seen a copy of the video referred to by RSPB and it does not correspond with the ongoing monitoring from our ornithologist on site. "We are fully aware of and compliant with the legal protocol and as such, we have asked the police and RSPB to seek further information so that the video’s authenticity can be fully examined. "We have removed the cherry picker while we wait for this information." The STAG action group has previously raised concerns about traffic management and wildlife protection at the new festival site. A spokeswoman for STAG said: "The nest now requires a protective buffer zone, which, as DF Concerts conceded long ago, rules out the festival being held at the estate. "We hope there is still time for T in the Park to go ahead at another, more suitable site."